That’s all it takes to transform your business. 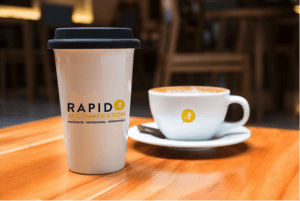 Sit down to have a coffee with Rapid and we’ll show you how we could take a huge stress off your shoulders, freeing up your time to focus on driving your business forward to much bigger and better things. And we can make booking a business trip as easy as a calling a friend. You see, here at Rapid, we believe it’s important to get to know each and everyone of our clients. Ask any of the companies we’ve worked with and we’re confident they’ll tell you it’s our personal approach that sets us aside from the competition. By understanding you and your business, we’re able to provide a bespoke service tailored to suit your needs. It’s why that first cup of coffee can make all the difference. We’ve found over the years that booking business accommodation and travel is one of those jobs businesses don’t think about too much…until it’s too late. It means you often end up spending far too long searching for hotels, missing out on the best deals and generally coming away from the whole experience stressed and unhappy. Worse still…we’ve found that a lot of the major comparison sites make it a lot tougher for you to find the best deals. Truth is, there are often better locations and better deals to be had offline. As we’ll explain when we meet up for that coffee, it’s our job here at Rapid to seek out those better deals. We first figure out what you need and then we figure out the most cost-effective way to fulfil those needs. And to deal with all the frustrating paperwork that goes along with booking business trips. You’ll soon see how much simpler life can be when you’ve got us looking after everything for you. But it might sound like something that will cost your business an arm and a leg. You’ll be shocked just how affordable it is to have us take the stress out of the situation and take care of everything for you. We’re always totally transparent about costs and show you how everything breaks down. For us it’s about more than just trying to save you money: it’s about becoming a part of your business. But you’ll see that straight away when we catch up for a coffee. So, to arrange a chat about how we could take care of your business accommodation and travel booking and help you to transform your business, give us a call on 0330 090 41 42.